Home > Health Matters > Is Your Computer Making your Child Fat? 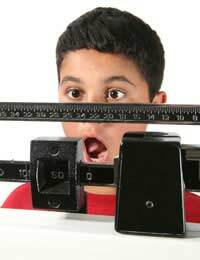 Childhood obesity is on the rise in the UK with over one million children on target to be clinically obese by 2010. But also on the rise is the amount of time our children spend on the computer or playing computer games consoles. Is this a coincidence or is there a link between computing and fat children? The single most common reason for children to become obese is a poor diet. If a child is eating a healthy balanced diet then regular computer use is not going to make them fat. There is a wealth of information out there (and much of it is available online) about how to educate our kids to eat healthily. While you can’t supervise every meal your child eats you can give them a good start. There is a link between children, computers and obesity which is based on the computer being an almost entirely sedentary activity. While your child is online, using the computer for schoolwork or playing most computer games they are not engaged in an energetic activity burning off hundreds of calories. If your child has a fairly active life spending a limited amount of time on the computer will not have any detrimental effect on their weight. Children who play on the computer for most, or all, of their out of school hours will begin to experience a range of problems, including probable weight gain and anti-social behaviour. As part of a normal active childhood school aged kids’ can safely use the computer for around two hours a day (although this should be their total screen time including TV). Get your child out of the house doing something physically active for at least an hour a day. In today’s society people are worried about kids’ security when they’re playing outside but there are after school clubs, local teams and other activities that can get your child active while keeping them safe. Computer use or gaming is less directly responsible for childhood obesity than excessive TV viewing. TV, especially childrens' channels, has adverts that specifically target children with junk food and sugary drinks. It is also totally passive and leaves viewers (adults as well as kids) with their hands free to eat their way through their favourite programmes. Computer games are more active and engage the mind and hands so players are less likely to ‘graze’ while they are playing. So called “active games” might be part of the solution to childhood obesity. There are a few different active games consoles on the market which get players fully and physically involved in the game. Probably the most common type of active games involve the player following a dance routine on screen but there are active games for a whole range of sports and activities. Active games could be a solution for very obese children, or kids with self esteem issues who do not feel able to join in ‘real’ active games with other children their age. Once they have mastered a virtual activity (and lost weight in the process) they will be more willing to try it in front of friends and classmates. Computers don’t cause childhood obesity and neither, in moderation, does TV or the occasional sweet treat. Childhood is the time when our children learn the habits they will take through life with them. If you get your child into good habits early they’ll have a far better chance at living a healthy life.